SCVHistory.com LW3208 | Film-Arts | Lobby Card: Winifred Westover (ex-Mrs. Hart) in 'Lummox,' 1930. Lobby card advertising "Lummox" (1930) featuring Winifred Westover, the ex-Mrs. William S. Hart, in the title role. Westover is at left. Dorothy Janis is being restrained. From what, we don't know, since the film no longer exists. Janis appeared in only five motion pictures; this was her only talkie. She retired at age 20 and married bandleader Wayne King in 1932. There is longstanding conjecture that Hart helped his ex-wife land the role, as Hart still had a financial/contractual relationship with United Artists and hadn't yet sued UA for breach of contract over his 1925 film, "Tumbleweeds." 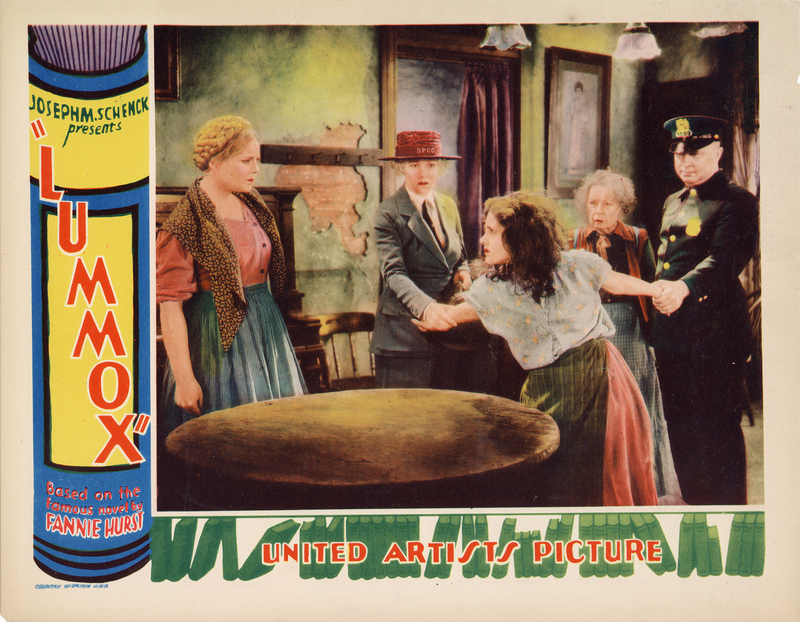 "Lummox" was released by UA on Jan. 18, 1930. Her biggest film role and only talkie, it was to be Westover's comeback after a eight-year absence from the screen. But it was not meant to be. Critics panned it, audiences rejected it, and Westover called it quits. Sadly, we can't judge the movie for ourselves because it is a lost film. Usually one thinks of silents when considering films that no longer exist, inasmuch as 82 percent of all silent films are believed lost. But some talking pictures are gone, too, and after this one flopped in theaters, apparently nobody thought to keep a print for posterity. UPDATE: Reportely the British Film Institute has a nitrate print, and UCLA has sound discs. Herbert Brenon's latest contribution to the audible screen is an adaptation of Fannie Hurst's novel, "Lummox," which is now on view at the Rivoli. It is for the most part a lethargic pictorial story with several unconvincing episodes, but the stellar player, Winifred Westover, former wife of William S. Hart, the two-gun man of silent films, commands serious attention through the sincerity of her portrayal of Lummox, the Swedish drudge, whose life is a series of bitter disappointments with selfish, thoughtless, unkind and unfair employers. Miss Westover has not appeared in pictures for nine years, but her performance in this current film would lead one to presume that she has not permitted the time to pass without studying acting. There is a vague suggestion of symbolism in this narrative, as it has been directed by Mr. Brenon, and for that reason the studied movements of the participants, including at times the acting of Miss Westover, may be overlooked. With the exception of Miss Westover's careful and commendable impersonation, however, the characters are more often than not like puppets at the beck and call of the director, an impression which is strengthened by the halting and recitative delivery of their lines. Ben Lyon is never really human as Rollo Farley, the fashionably attired young poet who during inebriated moments is inspired by the family servant, Lummox, to pen a sonnet on "Feet deep-rooted into the soil," when he sees the drudge in her bare feet out in the yard. Another of his effusions is suggested by Lummox's laconicism. This one, which is supposed to be a master-piece, is something about "A tower of silence under the sea." It is this rhyming reprobate who is the father of Lummox's child, a fact which does not cause him any misgivings. The real name of the drudge is Bertha Oberg. She is called a "lummox" by Chita, a wayward girl who is taken in charge by the Society of Prevention of Cruelty to Children after Bertha calls up that society. This act was prompted by Bertha's wish to save Chita; and often it happens this servant's good deeds bring misfortune to her door. Bertha is prevailed upon to give her infant son to a wealthy couple, and in the course of her dreary existence, years after, she seeks employment in this family, only to be told that she is too late for the job. She is befriended by one of the male servants in this house, who tells her about her boy, how tall he is, how he plays, and subsequently that the foster parents have decided to take him to Europe to have him taught the piano, the desire to become a musician having been inspired through a concertina which Bertha anonymously sends to the child. In one of the closing sequences, which brings the story up to date, Bertha observes a poster on Carnegie Hall, and for some reason or other she knows that the pianist who is scheduled to play is her son. She buys a standing-room ticket and leans against the wall, listening intently to the notes struck by the handsome young musician. It is perhaps here that Miss Westover does her outstanding acting, the expression on her care-worn countenance being one of mingled pain and admiration. At the end there is a pleasing touch, for Bertha, who has learned from agencies that she is not wanted as a servant because of her advanced age, enters a baker's shop kept by a kindly old widower who has several children. The woman who has been crushed for more than Twenty years is glad to be asked by the father to come and live in his home and look after his motherless brood. Miss Westover has a placid face and her fair hair is coiled on the top of her head for this rôle. As Bertha she is sluggish in her movements and her only sign of satisfaction is a half-hearted smile. As the years roll by, Bertha becomes even slower in her actions and not until the end does she really look cheerful. Her message of spiritual goodness fails, that is until she comes to the last few scenes. Myrtle Stedman, who will be remembered years ago for her fine performance as "The Famous Mrs. Fair," does well with a minor rôle in this current piece of work. William Collier Jr. figures in one of the episodes as a man whose wife can't see eye to eye with his mother. Dorothy Janis plays the indomitable and, afterward, penitent Chita. LUMMOX, with Winifred Westover, Dorothy Janis, Lydia Titus, Ida Darling, Ben Lyon, Myrta Bonillas, Cosmo Kyrne Bellew, Anita Bellew, Robert Ullman, William Collier Jr., Myrtle Stedman, Edna Murphy, William Bakewell and others, based on Fannie Hurst's novel of the same name, directed by Herbert Brenon. At the Rivoli Theatre. LW3208: 9600 dpi jpeg from original lobby card purchased 2018 by Leon Worden.